Antioxidants protect vision, according to Heidi Vollmer-Snarr’s latest research. New BYU-Cornell research shows that a diet rich in antioxidants can prevent age-related macular degeneration (AMD). 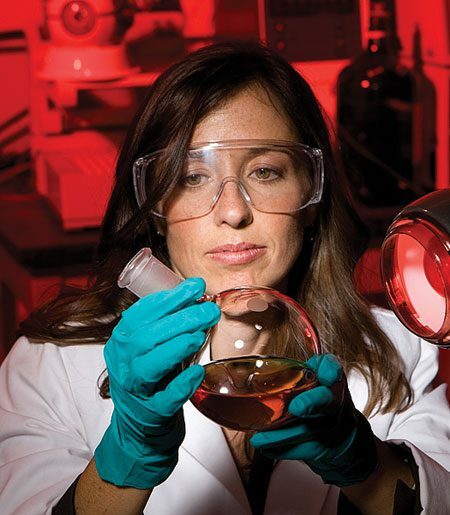 Or you could wear orange sunglasses—all day, everyday—instead, according to chemistry professor Heidi Vollmer-Snarr. “Orange sunglasses would keep the blue rays out of the eyes,” thus preventing a problematic chemical compound from oxidizing, she says with a smile. Bet she doesn’t recommend mentioning the sunglasses option to 5-year-olds, who might actually pick shades over spinach. Vollmer-Snarr, of course, advocates for antioxidants, especially after they prevented the compound A2E from oxidizing in her BYU-Cornell research. The presence of A2E in the eye is implicated in AMD, the leading cause of age-related blindness in developed countries. AMD affects more than 1.75 million people in the United States alone. In effect, this combination inhibits the symbiotic relationship between two types of eye cells: photoreceptors and retinal pigment epithelials (RPEs). Certain photoreceptors grow like fingernails, Vollmer-Snarr explains, and RPEs act like fingernail clippers. RPEs are also irreplaceable; if RPEs are damaged, photoreceptors grow unchecked and begin to fail. The photoreceptors responsible for vision in dim light are often the first casualties: an early symptom of AMD is having trouble seeing while driving at night. Vollmer-Snarr, along with graduate student Junping Gao (MS ’08), synthesized A2E in a BYU lab for the study, which was published in the Journal of Biological Chemistry in September.